In this edition of Muscle Car Milestones, we’ll take a look back at one of the hottest Buicks from the 1970s. Long-known as a luxury carmaker, Buick’s entry into the muscle car phenomena started with the Wildcat and then followed with the Riviera GS and Skylark GS. Then in 1970, it transformed the GS-455 into one of the most powerful and fastest muscle cars to come out of the classic muscle car era. 1970 was a pinnacle year for General Motors muscle cars. GM’s A-body lineup featured some of the most powerful muscle cars you could buy. It was also the year GM lifted the edict that banned engine sizes greater than 400 cubic-inches in A-bodies. Now the divisions were shoehorning massive big block powerplants with tremendous amounts of horsepower under the hoods of the Chevelle, GTO, and 442. Not wanting to be left out, Buick took the already great GS-455, added some sizzle and pizazz, and created the GSX. So what makes a GSX a GSX? The GSX is basically a GS-455 with the A9 option group. This includes a hood mount tachometer, power front disc brakes. 4-speed manual transmission, Rallye Ride Control suspension package, front and rear spoilers, and heavy-duty cooling package. Inside, you get a Rallye steering wheel with Rallye instrumentation, bucket seats, and a custom interior trim package. All this plus a 3.64 axle ratio with posi-traction differential and 7-inch wheels set you back $1,196 for the package. This was one of the most luxurious muscle cars you could buy. Even though it was a performance car, Buick didn’t skimp on amenities and creature comforts when creating this car. You have to admit, the GSX is one of the most radical Buicks you’ve probably ever seen. It was the type of car that looked really fast, even when parked. The 1970 GSX was available in only two colors. 491 were produced in Saturn Yellow and 187 were produced in Apollo White. Both colors came with black body striping that flowed across the top of the front fenders, doors, rear quarters, and rolled over the rear spoiler. Another standout feature of the GSX was the size of its wheels and tires. Buick installed 7-inch wide rims with fiberglass-belted G60-15 Goodyear Polyglas GT tires with 9-inch wide treads. The GSX came standard with a 455 cubic-inch V8 with 350 horsepower and a whopping 510 lb.-ft. of torque. Astonishingly, maximum torque was reached at only 2,800 rpm. This lofty torque number was also the highest available in any muscle car in the classic era. A four-speed manual transmission was standard and a three-speed Turbo Hydra-matic 400 transmission was available at extra cost. Buick also offered the $114 Stage 1 performance package for the GSX. It consisted of a different curved distributor, upgraded camshaft, larger valves, ported heads, and modified jetting in the carburetor. Buick rated the Stage 1 at 360 horsepower but those in the know would tell you that actual horsepower was closer to 400. Cars Magazine tested a GSX with the Stage 1 package and walked away with a 0 to 60 time of 6.2 seconds and a quarter mile time of 14.0 seconds at 103 mph. Motor Trend flogged the GSX and went from 0 to 60 in 5.5 seconds and realized a time of 13.38 in the quarter mile at 105.5 mph. Not bad for a car weighing almost 4,000 pounds. The automotive press absolutely loved the GSX. Motor Trend declared it was the quickest American production car they had ever tested. Cars Magazine raved “we’ve driven just about every Detroit supercar and ponycar made with just about every engine and suspension option and the GSX is best.” Another interesting footnote is that in their November 1984 issue, Popular & Performance Car Review ranked the 1970 Buick GSX Stage 1 number three in their list of “The 50 Fastest” muscle cars. The GSX Stage 1 lost out only to the 1966 Shelby 427 Cobra and the 1966 Chevrolet Corvette 427. 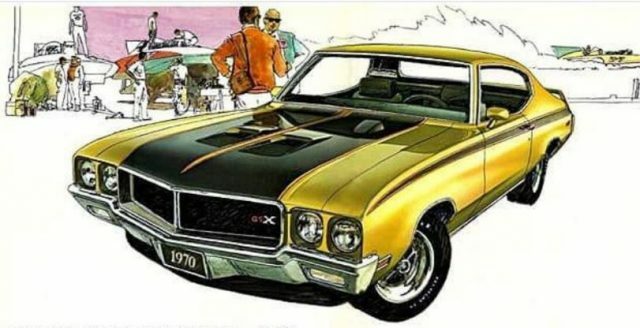 The 1970 Buick GSX proved that even though Buick was primarily a luxury brand, it could produce one heck of a muscle car. Even though it wasn’t as popular as the Chevelle or the GTO, the 1970 GSX is still regarded as one of the finest muscle cars to come out of the classic muscle car era. Due to low production, seeing one these days is rare so take the time to check one out if you get the opportunity.